Reina @ Pt England School: My furniture design. Last week I came back from my dad’s house up north and now I’m back in Auckland I started back at school on Monday the 4th of July. A few days after I came back Room 19 had already started on their Prototype for the street it had to be Furniture. On Friday the 8th of July the same week I started on my prototype I looked online and tried to look for something to design. It was hard to choose, so I made my design up in my mind then I drew it on paper in my book. It was our last week of school and it was a Monday. 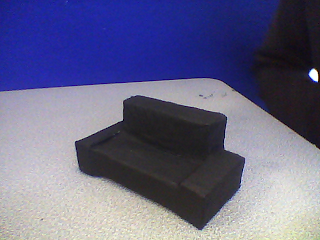 I started on my Model I had to figure out a way to make 4 box’s on cardboard I drew 2 Armrest , sitting place and the back of the chair. Then Tuesday came and I masking taped my boxes together and it looked like the couch I wanted. After lunch I started on my gluing I used P.V.A glue and glued the newspaper to my Model. On the 13th of July I finished paper-’mashieing’ my design and I’m just waiting for it to dry. Just when Interval was finished I got told to take three chair’s into the green screen room and I had to take photo’s with people on chair’s with a Green cloth over the top so you take a photo of there Prototype and get the people in the photo to look like there sitting on there Model. After Lunch it dried up and I started painting half of it then I finished painting the whole thing when the bell ring. Today I had to finish off my writing for my blog to tell every how I made my prototype.